Richard Pugh is the Product Marketing Manager for Mentor's Emulation Division. He holds an MSc in Computer Science and Electronics from University College London. New markets for multimedia and high-definition video are helping drive silicon growth. One market which exemplifies that is unmanned aerial vehicles, or drones. 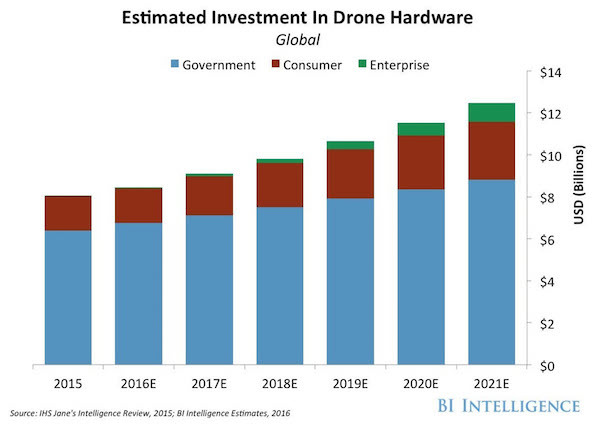 A recent report from BI Intelligence estimates that investment in drone-powered solutions will exceed $12bn by 2021 (Figure 1). Against this backdrop, the drone segment is benefiting greatly and advancing rapidly thanks to its use of hardware emulation. With drone applications expanding beyond military systems into consumer and commercial uses, the market is getting ever more competitive. To keep up with the market’s evolution, drone silicon suppliers are integrating high-definition video and other features into their SoCs. 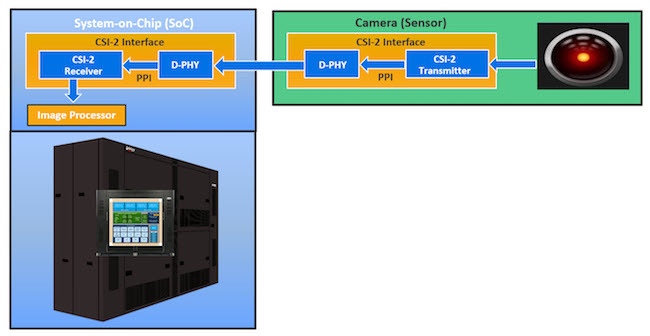 Verification of the video capture circuitry, data collection components, and UHD-4K streaming video capabilities found in drones is challenging. The Economist recently reported that a single drone flight can generate as much as 100 gigabytes of data. Given that vast amount of data created and consumed by drones, designers need the capability to undertake exhaustive verification of the video capture circuitry and data collection components that either store data in-system or upload that data to a larger storage infrastructure. At these volumes, simulation is simply too slow. Designers need some form of acceleration. Emulators deliver acceleration at hundreds or thousands of times the performance of simulators. Emulation has the speed, capacity and performance to churn through not only massive amounts of data but also long sequences very quickly. Verification of the latest High-bandwidth Digital Content Protection (HDCP) 2.2 anti-piracy protocol needs to be inherent in the emulation system used for verification. Content protection is a key issue for multimedia applications. The basic methodology is similar to any way in which data is sent and encrypted with a key, and then decrypted at the other end. However, HDCP 2.2 introduced major upgrades so that compliant verification ensures this process is working properly. Verification engineers must generate or capture increasingly large data streams to exercise and test the system. A good example is a UHD-4K stream. This requirement stands regardless of whether the target application is drone technology or UHD TV. An appropriate emulation solution is capable of not only generating very large data streams, but also checking that they are compliant; that they can be fed to the design-under-test (DUT); and that the DUT displays the resulting video and audio content correctly. Multimedia design verification must detect issues in chips that encode and decode real-world data with high video content. Mentor’s Veloce VirtuaLAB Multimedia is the only emulation solution with features developed specifically for this purpose. It allows verification engineers to graphically visualize and debug what is happening in each individual frame and pixel of the test file. This delivers huge benefits when debugging multimedia designs compared to working with only the data and waveforms provided by traditional simulation solutions. On that last point, a company in China that creates complex video chips for drone applications recently ran five unique multimedia designs on a Veloce emulation system. Design sizes ranged from 15MG to 25 MG. Emulation performance was the critical factor. Multiple video protocol standards were used (HDMI, eDP and MIPI CSI-2). 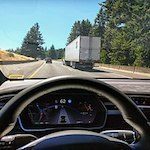 By using Veloce VirtuaLAB Multimedia, they found multiple bugs in both their DUT (RTL) and firmware that would have been very difficult to find without an accelerated verification environment designed for multimedia applications. Let’s look under the hood. To perform effective verification of a multimedia SoC, there must be a virtual audio-visual device to generate or receive/display UHD-4K streams to and from the DUT (along with HDCP 2.2 encryption/decryption). This configuration allows teams to verify and debug the SoC pre-silicon in a software-based environment, providing user flexibility and a high performance. UHD-4K verification solutions for use with hardware emulation meet these needs (Figure 3). With the UHD-4K protocol running as a software model on an emulator, engineers can use system-level applications to drive the verification and debug process from a PC or workstation. Instead of having to painstakingly build a testbench to create a UHD-4K stimulus, users can simply grab an ordinary video file, even a pre-existing AVI (or WAV, TIFF, or BMP) file, and auto-convert it into a UHD-4K stream. Auto-generating a protocol-compliant UHD-4K stream saves time and risk since it eliminates the need to validate conversion compliance. The UHD-4K stream content is user-controllable by selecting a preferred pixel format or other parameters, and the UHD-4K output is compliant. Set up for the stimulus can be done in a wizard or command line, including scripting of multiple stimuli. Having auto-converted the video file, the UHD-4K protocol software plays the resultant stream into the DUT running on the emulator. The emulator extracts and displays the audio-video output from the DUT and supports pixel-level graphical debugging of the displayed content. Users can trace particular streams or frames in detail, in video and audio. An AVI can be exported from the DUT output to verify that it plays as expected in a real user application, such as Windows Media Player. This allows for inspection by the human eye that can pick up errors in audio and video more efficiently than stepping manually through waveforms. Users can still zoom-in to the image to scrutinize pixel data and examine audio detail, or export data for step-by-step waveform debugging if needed. To facilitate debug, a programming interface can be used to export the display stream database and validate pixel data by comparing the actual against the expected outcome. If a problem is found, the log data can be output, showing content and time, so engineers can trace back on the emulator to what else was occurring when the error happened. Debug can be a live process, capturing DUT output directly into a display and debugging on-the-fly to analyze and fix a problem immediately. Alternatively, results can be captured in a database for subsequent debug. In batch mode, automated regression testing can be performed and may also be scripted for increased efficiency and productivity. With new multimedia standards and capabilities emerging to meet increasing demand, ever more companies are going to need emulation to churn through the enormous masses of data required for verification. The VirtuaLAB Multimedia application verifies any design that includes graphics, display/monitors, and HDMI (the widely adopted protocol for capturing and encapsulating video and audio used in multimedia equipment today). Virtualized, multimedia-targeted emulation solutions reduce the risk for UHD-4K and HDMI developers by giving them a virtual environment in which to eliminate the fault errors at the pre-silicon stage. Virtualization further increases verification productivity by making emulator resources available 24/7 from anywhere in the world, and by significantly reducing the time to set up and run new projects. To learn more about the challenges of the multimedia market, and how an emulation-based verification methodology offers design teams a significant advantage, download the whitepaper Drones, Augmented Reality, UHD TV – High-End Video SoCs Need Emulation.